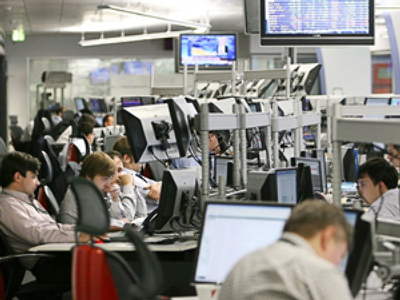 Russian stocks laboured through Friday as oil languished and metals provided no support. Both indices spent much of the day down, before an afternoon rally buoyed the Micex to close at 612.05, up 0.65%, while the RTS fell 5.1% to 634.22. Oil prices continued to provide the trend line for Russian investors with Nymex futures and the WTI spot price holding under the $35/bbl mark, and Brent struggling to hold its place over $40/bbl. The net result on the day in Moscow was to see nearly all of the energy majors mildly lower with Lukoil (down 1.36%), Surgutneftegas (down 0.16%), Gazprom-Neft (down 1.0%), Gazprom (down 1.49%), Ritek (down 1.40%), and Rosneft (down 0.26%) all posting falls of less than 1.5%, and leaving Novatek (up 3.0%) to rack up the days notable gain in the sector. Metals prices provided no succour, with meagre gains in nickel and zinc offset by further falls in tin lead and copper, and gold and silver easing further as the U.S. dollar firmed. That saw Norilsk Nickel (down 1.21%) and Polyus Gold (down 6.22%), while Polymetal (up 4.4%) pushed higher. Steelmakers Severstal (up 4.64%) and NLMK (up 7.16%) got some good traction on the day while MMK (down 0.84%) dipped out. Elsewhere, fertilizer producer Acron (up 0.79%), coalminer Raspadskaya (up 3.41%), pipemaker TMK (up 0.46%), and grain producer Razgulay (up 1.27 %), all managed a little bit of upside, while titanium producer VSMPO-AVISMA (down 0.67%) dipped out. In the financial sector, state owned megabanks VTB (up 0.94%) and Sberbank (up 2.93%) edged higher while smaller private rivals Bank Vozrozhdenie (up 0.01%), Bank Moskvy (down 0.92%) and Rosbank (down 4.15%), had a worse time of things. In the retail and consumer goods sector, upmarket retail chain Sedmoi Kontinent (up 11.19%) got a boost from reports the Moscow City Government was not going to take control of the company. Downmarket rivals Dixy (up 2.7%), Magnit (up 2.04%) posted more modest gains, as did beauty products maker Kalina (up 4.57%), and drugmaker Veropharm (up 1.94%), while Lebedyansky (down 8.49%) and Wimm Bill Dann (down 4.10%) found it was not a day to be a producer of soft beverages or baby foods, and Baltika (down 1.29%) a day for something heavier. In the land of the telecoms CenterTelecom (up 0.95%), Uralsvyazinform (up 1.16%), Dalsvyaz (up 1.12%), and Rostelecom (up 0.38%) found smidgins of upside, while MTS (down 0.01%),Sibirtelecom (down 0.59%), Southern Telecom (down 1.09%), Volga Telecom (down 1.80%) found smidgins of downside and MGTS (down 5.37%) found the mother lode. Automakers Sollers (down 0.87%), Avtovaz (up 1.83%), and Kamaz (up 0.16 %), didn’t get much of a boost from proposals to subsidize purchases of domestically made cars. Aeroflot (down 9.54%) found itself on the receiving end of a sell off on the news that a 25% shareholder was facing a margin call on the stake, while rival Utair (up 7.33%) found itself the subject of renewed interest. Property developers PIK Group (up 7.39%), Sistema-Hals (up 5.85%) and LSR Group (up 2.15%) found some traction.